At Citrix, their mission is to power a world where people, organizations, and things are securely connected and accessible. A place where all business is digital business. A world where customers are empowered to make the extraordinary possible. We will accomplish this by building the world’s best integrated technology services for secure delivery of apps and data ⎯ anytime, anywhere. 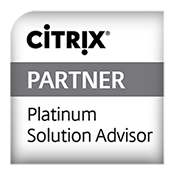 A2U is a proud, Citrix Platinum Solutions Advisor, demonstrating the highest level of expertise and commitment to the entire Citrix portfolio of products. To learn more about how Citrix can help improve your business, visit https://www.citrix.com/. eG Innovations helps businesses across the globe transform IT service delivery into a competitive advantage and a center for productivity, growth and profit. Their award-winning technology provides organizations with a 360 degree view of their entire IT infrastructure, and allows your team to easily collaborate and solve key user-visible problems. A2U is proud to be among a worldwide network of leading technology companies as a premier partner. To learn more about how eG Innovations can empower your business, visit https://www.eginnovations.com/. IGEL’s endpoint management software is revolutionary in its simplicity and is purpose-built for the enterprise. By shifting granular control from the end user to IT, IGEL empowers IT to do more with less, while giving users a familiar and trouble-free experience. As a top level partner, A2U has committed to delivering customers the best endpoint management solution. To learn more about IGEL, visit https://www.igel.com/. As a platinum partner, A2U has the skills to architect, implement and optimize RES/Ivanti solutions and is specifically trained to provide a unified, consistent and cost-effective user-oriented experience. To learn more about Ivanti, visit https://www.ivanti.com/.